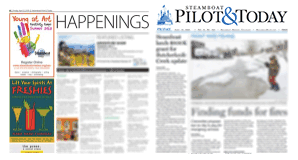 Over the years there has been no better ambassador for the mountain than the people of Steamboat Springs. Recently, the mountain seems to have taken that fact, and us, for granted. As far as the mountain is concerned, we’ve gone from partner to blank check. Its time to vote “no” on 2A and remind them that we need a fiscally responsible partner. First, one need only look at the new lift ticket price structure. Kids Ski Free? Gone. They’ve literally raised the cost of skiing for every kid in the Steamboat School District. Eight- and 15-day passes for the mountain? Discounts for seniors? Gone. I got the message loud and clear. You’ve raised the price for an annual lift pass by $200 for every kid in the school district and $300 for every senior and now you want to plead poverty for an airline seat tax. Really? Second, look at the Mountain URA and their “careful” stewardship of public funds. While not the same organization as Ski Corp., peel back the onion and you’ll see two co-mingled organizations with a common purpose. The URA’s latest “good idea” is to use $650,000 of public money to prepare and move a private structure from private land onto … private land. What an investment. And we’ve got 10 more years of this ahead of us before the URA expires. Wow. Third, the lodging community pays nothing. From the Yes2Air flyer: “The Local Marketing District generates approximately $1.6M through a 2 percent accommodations tax, paid entirely by visitors.” That tells me they pay nothing. Finally, they promised growth to 140,000 airline visitors the last time we passed this tax; they never came close to delivering. Now, they want to forget about past promises and distract us with talk about the number of cities serviced. This is lipstick on a pig. One big airplane from L.A. delivers as many visitors as five aircraft from five smaller cities. Driving from Denver or flying in from L.A., their money spends the same. That $1,345 spending is for every winter visitor, regardless of mode of travel. In the end, I take issue with this new relationship with the mountain. It’s time we remind the mountain that we expect both respect and careful stewardship of our money. This is my message when I vote “no” for 2A.